Customers today are used to buying products and services through digital means and insurance is no exception. 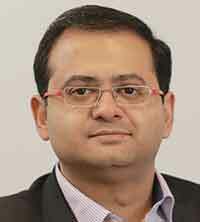 Anshuman Verma, Chief Marketing & Digital Officer, DHFL Pramerica Life Insurance, an IIM Calcutta and Delhi College of Engineering alumnus, his core expertise lies in building strong business strategies and aligning them with the marketing technology. With the domain expertise in financial services, telecom and consumer product categories, Anshuman has created competitive advantages across organisations with a start-up mindset. How does the plan suggestion based on lifestyle work? Do people follow these suggestions? Setting off on a financial journey can lead to mixed emotions: hope and excitement, but also uncertainty about how complex and time-consuming managing your money can be. Whether a customer is starting a family or saving for retirement, they require right guidance to achieve their financial goals. Insurance advisors often take a need-based approach to guide customers towards their financial goals. They often pitch products like term plan or critical illness plans on the basis of customer's lifestyle. Good advice is the cornerstone for a successful financial outcome. When it comes to pure protection benefits, people do follow the suggestions. But if a customer is already covered under such plan then they will ask for conventional/traditional plans which usually gets pitched on the basis of customer’s lifecycle. Kindly brief us about the various plans and services offered by you? DHFL Pramerica provides a wide range of life insurance solutions for individuals as well as groups taking care of our customers’ various financial protection needs such as securing their child’s future, retirement planning, savings and wealth creation. DHFL Pramerica Dengue Shield: Dengue Shield is the only fixed benefit dengue health product in the life insurance industry offered by DHFL Pramerica Life Insurance. A unique proposition which covers individuals against the financial impact of dengue related hospitalization. The innovation here is not only in the product design but also in the process; customers can purchase this policy online from company’s website in less than 5 minutes without any hassles. In this product one can cover up to 6 family members along with himself/herself and can get an attractive discount. Also the policy does not expire once a claim is paid, policy has one of its kind feature wherein life insured can file for one claim each policy year during policy tenure of 5 years. Along with Individual cover, we also offer this product as a Group policy where organizations can cover their employees against financial impact of dengue, chikungunya and severe malaria at a very affordable cost. Even group insurance can be taken online. The real innovation lies in the claims and customer service. We have simplified the claims procedure and streamlined the process of Online Claims. DHFL Pramerica Life Cancer + Heart Shield: A comprehensive health protection plan which provides cover against financial impact due to related issues like cancer heart disease and 26 critical illnesses. This innovative product gives flexibility to choose between multiple options of taking cancer + heart protection or cancer and heart protection as standalone policies. In addition to this, customer has an option to add critical illnesses rider to protect against 26 major critical illnesses hence making it a product which covers 44 critical illnesses overall and stands out from its competition in market. Also, where other regular plans provide benefits on major stage only, Cancer+Heart Shield covers major as well as minor stages and helps in reducing financial stress. Another innovative feature of this product is increasing Sum Insured; this feature helps to beat medical inflation by increasing base Sum Insured under this plan by 10% for each claim free year till 150% of base Sum Insured without any increase in base premium. This product is also topped up with a Monthly Income benefit feature which gives a real peace of mind as you know that you are not only covered for hospitalization expenses but also from loss of income during your recuperation period. DHFL Pramerica Life Flexi e-Term: An affordable and comprehensive protection plan which can be taken online to cover not only life but also for protection against critical illness, terminal illness and accidental death. This plan understands that people while taking a term plan do not consider their future liabilities and responsibilities in mind and hence end up taking less insurance or remain underinsured. Keeping this in mind, Flexi e-Term plan provides an option to enhance your life cover on major events of life like marriage, birth of a child or purchasing a house without purchasing a new policy. This product also provides flexibility to life insured to choose how they get paid for maturity benefits i.e. either fixed or increasing, lump sum or staggered, depending on the need. DHFL Pramerica Smart Income: Smart Income’s innovative design is such that it provides flexibility in the hands of customers. Flexibility in terms of policy tenure, premium payment term, entry age, etc. There are very few plans in industry which provide coverage till the age of 60 years that too with applicable tax benefits. The unique proposition of this product is its benefit design where you have the flexibility to choose your income payout period which will become your premium payment period also. An annual income stream will start post maturity which will be guaranteed on day 1 of taking the policy. Customer will also have the flexibility to take lump sum payout in place of annual income during the payout period. In today’s time, where everyone looks for customized solutions for themselves, this product suits them in perfect way, fits best with all segments and customer needs; whether it be savings or child education, retirement or investment. DHFL Pramerica Flexi Cash: DHFL Pramerica Flexi Cash is a participating non-linked endowment plan which gives you the flexibility to control your policy. This plan helps you to manage your financial requirement as per your needs. You can access your savings corpus at any time of your need within the flexi benefit period, get steady income in the form of guaranteed loyalty benefit and financial protection for your family in case of any uncertainty. Flexi cash is the only product in the industry which gives a guaranteed pay-out from the second year (not a bonus pay-out). Rakshak Gold: DHFL Pramerica Rakshak Gold is a non-participating guaranteed endowment insurance plan that has been designed to ensure that your family’s financial future remains secure. How is DHFL Pramerica placed vis-à-vis its peers? DHFL Pramerica’s annualized premium has grown at 56% YTD (in the first 6 months of this financial year) over last year. What is your geographical presence? What is the ratio of urban vs. rural? Shiksha Uday - Shiksha Uday is a DHFL Pramerica Life Insurance initiative designed especially for parents to help them protect their child’s right to education. This channel is dedicated to ensuring uninterrupted, quality education to school children. Its mission is to help provide quality education to every child. Under this program, we partner with like-minded institutions that are as dedicated to this cause as we are. So that, together, we can provide parents a platform to protect their children’s education expenses and help children complete their education to realize their dreams. What is your business model? Is it focused towards online or you have dedicated branches? Customers today are used to buying products and services through digital means and insurance is no exception. The business model of DHFL Pramerica Life Insurance follows a mix of online and offline sales. Like mentioned earlier, our products are available both online and offline. Currently, we have 126 branches operating across the country which caters to the diverse needs of our customers from across the country, be it from urban, semi urban or rural India. Similarly, our website is very user friendly where users can purchase policies in a hassle free manner. In the website, the product features and the benefits are mentioned in an easy to understand way. To ensure that DHFL Pramerica Life Insurance Company Limited is seen as a digital leader and our customers perceive us as such, the company has embarked on the digital transformation journey. Ace App is our mobile based application equipped with smart cutting edge digital tools and power packed features to be called a “Mobile Office on the Go” for our agents. Ace App helps in generating real time quotations. ACH (Automated Clearing House)/ECS (Electronic Clearing System) process has been automated through this application. Another advantage is the real time validation of PAN card. During the on boarding process, an agent can save customer’s data and can resume anytime as the information once filled will remain saved. The hot tablet facility is another important feature through which multiple agents can login in one device using sign in and sign out facility. End to end proposal filing can be done through this App (e-proposal submission). It is directly integrated with our policy admin system so the cases logged through this application will be available for operations team to act instantly. Another innovation is a chatbot called RIA which is a virtual chat assistant accessible via Facebook Messenger. RIA demonstrates our capability to harness digital technology, as it can converse on the web with customers instantly. This virtual chat assistant is an important pillar in our strategy to focus on technology and digital platforms and allows us to deliver a significant speed of response and helps in a seamless customer experience across all our distribution and customer touch points. RIA chatbot was initially launched to sell and provide service for Dengue Shield, which delivers benefits to policyholders who get infected with the dengue virus, a tropical disease transmitted by mosquitos. Using RIA, customers can purchase Dengue Shield in just a few clicks. After an initial trial, the chatbot’s capabilities have been expanded to address other general customer service requests, such as information on premium payments, renewals and policy fund values, for all of the company’s products. How much is your customer base at the end of Q2FY19? DHFL Pramerica has in-force base of 301,326 lives on Individual platform & 22,981,431 lives on group platform. How was the company's performance in Q2FY19? DHFL Pramerica life insurance is continuing its journey of growth and profitability. In the H1 which ended on September 30th, 2018, DHFL Pramerica has registered a 20% growth (YoY) in Gross written premium (GWP) which stood at Rs. 1,137 Crores. The 13th month persistency of the company has been 80% while the solvency ratio has been at 491%.